THE PERKS OF BEING A WALLFLOWER is a handsomely made, well-acted and sporadically insightful coming-of-age movie set in early 1990s Pittsburgh, and based on an apparently cult novel. Adapted for the screen and directed by the author, Stephen Chbosky, the movie stars Logan Lerman (THE THREE MUSKETEERS) as Charlie, the eponymous wallflower, who is saved from High School wretchedness by the step-siblings Sam (Emma Watson) and Patrick (Ezra Miller). These older teens have a comfort in their own non-comformity that inspires a starstruck Charlie - they delight in performing in midnight screenings of The Rocky Horror Picture Show, and Patrick is comfortable in his homosexuality. Their friendship enables Charlie to start dating, face his feelings for Sam, and the reasons for his mental fragility. What I love about this film is the empathy and honesty it shows to issues of teenage sexuality, drug use, sexual and physical abuse. It does so without feeling like a TV special, forced or contrived, and has a kind of delicate intimacy to it. I can see why so many kids have responded so strongly to the book. The only quibbles I have are with how underdeveloped the character of the sympathetic schoolteacher, played by Paul Rudd, is, and how such achingly hip kids wouldn't have already heard David Bowie's Heroes. 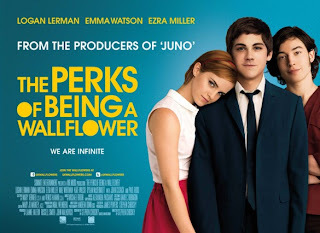 THE PERKS OF BEING A WALLFLOWER played Toronto 2012 and is on release in Kazakhstan, Lebanon, Russia, the UAE, the USA, the Philippines, Aruba, Canada, Ireland and the UK. It opens on October 9th in Taiwan, Singapore, Thailand and the USA; on October 18th in China, Hong Long, Israel, Brazil and Colombia; on October 25th in the Netherlands, Serbia and Mexico; on November 1st in India, Austria, Germany and Finland; on November 9th in Peru and Norway; on November 22nd in Portugal; on November 29th in Argentina and Australia; on December 7th in Uruguay; on December 13th in Greece and Ecuador, on December 28th in South Africa; on January 2nd in Belgium and France; on January 17th in Chile and Latvia; on February 7th in Bolivia and Spain; on February 14th in Italy; on February 21st in Croatia and on April 4th in New Zealand. THE PERKS OF BEING A WALLFLOWER has a running time of 102 minutes and is rated PG-13 in the USA.